left to right, - Londo Molari, Delenn and Varn, with Delenn's teacher and friend, Draal [Louis Turenne], the new Planet Guardian. A Voice in the Wilderness, is a riveting two-parter from the first season. The story reveals how the Planet Guardian is bonded, both physically and mentally, with the Great Machine at the heart of an abandoned planet, formerly the home of an enigmatic race of ancients, whose name is unknown. 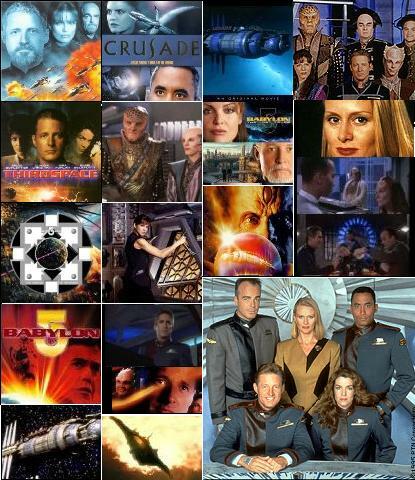 The destiny path of Epsilon III and Babylon 5 are linked. Later in the year, Draal created the temporal rift in sector 14 where the Babylon 4 station had been, to allow John Sheridan and Jeffrey Sinclair to take the White Star back in time. Once the White Star arrived back in the present, Draal closed the rift. The fourth space station, Babylon 4, had vanished twenty-four hours after it became fully operational. The remarkable Great Machine guards the planet and Babylon 5 against various kinds of interference. It functions as the Deva of the entire planet. B5 is situated in the Epsilon Eridani binary star system, located at the fifth Lagrangian point between Epsilon III, the third planet in the system, and its moon. Commander Ivonova�s Delta squadron is in a raging fire fight with raiders who have been picking off vital Babylon 5 supply ships. The battle establishes the �mousetrap� theme, a structure played out in additional major - and mini - scenarios during this movie. Captain John Sheridan�s white star fleet surround the raiders and cut off their escape; that forces the raiders to surrender. On Delta's return route to B5 Ivonova picks up a strange reading � a large, diagonally drifting, displaced relic in hyper-space. There is an allusion to the traditional forces of assimilation and dissemination throughout the story, presented in a variety of encounters. Everyone is transfixed by the beauty of the artifact � it is over 1 million years old. It �feels� as though it is something everyone can recognize, like a universal akasha record. B5�s general population continually express a desire to get some sleep, but invariably enter the artifact via dream exploration [the astrosome], and study the complex construction of its interior. Many on Babylon 5 respond to the emitted telepathic signals and start to act as �messengers� charged to prompt both IPX doctors and their research team to speed up work. They also tell Ivanova and Zack they want to enter the city because they �belong� to �them.� More later about the telepathic and astral links from the the artifact; they tie into above mentioned Tarot Trump and, by extension, Trump VI and Trump VII. Trent commands an impressive back page file on several topics, many withheld from Sheridan. She does provide Lyta�s detailed history about her visit to the Vorlon home world. �There was no way she could have survived if the Vorlons hadn�t come for her.� Dr. Trent proposes Captain Sheridan place Lyta under house arrest until the ancient relic is thoroughly explored. At this juncture Dr. Trent effectively casts Lyta in the role of Pandora before she opens the box, asserting she is P9 or above. Even though Lyta warns everyone to stop going further with the investigation there is a suspicion she may be under Vorlon influence and unconsciously seeking a way to endanger the entire operation. Trent and her assistant begin the preliminary probe that launches the discovery program for the artifact. She says, �Let�s start up with a metallurgical analysis and see where that takes us �� but ultimately her ambition is to reconnect the mechanism, start it up, and discover what it was designed for. Nothing about the excavation is conventional and Sheridan is concerned about a 30% increase in violence throughout the station since the artifact arrived. Security takes steps to separate everyone on the station to avoid mayhem; some voluntarily seal themselves off in their rooms. The B5 collective break-up during the first five days of research is the immediate social effect of the dark city and its tower on the B5 psyche. But the loss of power is causing problems all over the station and will soon leave B5 dead in space. At this intersection the artifact represents the inverse of New Jerusalem, Trump XXI. Trent speculates the ancient aliens created an �original jump gate� with technology that predates present day science; the relic leads to an entirely different kind of space � Thirdspace � it almost instantaneously transports a ship. The Tower � Trump XVI has its own unique positive and negative story development, just like Babylon 5 itself. The constructive alchemical design of the Tower of Babel is perhaps a key to the storyline and character development. Babel was a seven-tiered structure composed entirely of the seven precious metals known to the ancients. There is a legend that the top level was a golden room that housed a creature supposed to be a vessel for divine consciousness. Some descriptions suggest characteristics similar to a prehistoric reptilian life form that links the mythology to our ancient north star in the constellation of Draco. The dark city and tower that finally led the Vorlons to Thirdspace would represent the agents of anti-life, generated by pride, as explained by Lyta to Sheridan and Delenn. Lyta eventually pulls up and shares some �left over programs� with Delenn and Sheridan � a Vorlon �race memory� about the error of pride. The first mistake is the error from which all others proceed. We believed that we were superior to the universe that gave us birth� We resolved to storm the gates of heaven itself�the well of souls, the foundation of all life� to touch the face of God and become Gods ourselves�� But, the door must be open from both sides. Sheridan asks, �What do they want?� The answer is chilling. Early on, Ivanova and Vir share a vivid dream experience of the superficial architectural lines and atmospheric conditions inside the artifact. Later, Ivonova asks Vir what he remembered about the experience - if he saw what happened to her � he said yes, she didn�t make it out of the city. Lyta is the first to dream about the dark city and the 5 mile high tower. Her first vision surfaced when Ivanova initially pulled the artifact up on her screens out in space. Once the artifact makes it through the jump gate Lyta continues to see the city and tower from a variety of angles. She promptly gets up, dresses and gets into the elevator. During a classic miscommunication scene [typical of a stranger side of Trump XVI] Lyta's elevator trip with Zack illustrates how two people in the same conversation can participate in two entirely different conversations without realizing it. Zack carries on his one sided conversation while Lyta stares straight ahead � in a trance � even through a power failure-fluctuation in elevator. Lyta continues to repeat something continuing to stare straight ahead without blinking, while Zak continues the pitch. He is so wrapped up in his packaging and delivery style, concerned about saying the right thing in the right way, he remains completely oblivious to Lyta who hasn't heard a word he has said. Since we bear a greater responsibility, we�re afforded greater latitude. 1. What time of day does Jeffrey Sinclair most enjoy? 2. Techno-mage Galen raises a �Call To Arms.� He contacts four to work on the mission. They are ISA President John Sheridan, Dureena Nafeel, Captain Leonard Anderson of the EAS Charon, and ____________________. 3. �Parliament of Dreams� advanced the cause of inter-planetary peace and understanding by, a) Inviting representatives from The League of Non-Aligned Worlds to participate in universal calibration of all technology, with a Zocalo light show, b) B5 station celebration to observe the newest registration of all Babylon 5 hollo-diplomat representatives who are authorized to stand in for incarnate diplomats, or c) Encouraging every alien species on Babylon5 to demonstrate their dominant belief for a week. 4. In �Mind War� Bester and his Bloodhounds arrive on B5 looking for, a) The ingredients recipe for a new drink served in the Zocalo, said to enhance long range telepathic skills, b) Life Science team cooperation to facilitate entry to a contested sector of space, or c) Psi Corps volunteer survivor. 5. �And The Sky Full of Stars� closes with Sinclair�s personal log entry @ 2300 hrs: �I remember, I was taken inside a Minbari cruiser� What is it they don�t want me to remember? I have to find out.� Sinclair realizes the Minbari: a) Wiped memories of his interrogation by the Grey Council, b) Studied the high tech equipment aboard his ship then downloaded the ship log and computer files before they let him go, or c) secretly initiated him into an elite core group that reports to The Grey Council while asleep. 6. Londo offers to take Lennier under his wing and introduce him to B5 revelations of the highest order in, �The Quality of Mercy.� Lennier first learns the secrets of, a) The Dark Star, b) Centauri healing beverages, c) Credit check and balance systems. 7. Michael Garibaldi and Lise Hampton-Edgars are ultimately married by a _______________ of the First Baptist Church of Mars (Reformed). 10. Ivanova is thought to be a latent telepath, about the level of a) P1, b) P4, or c) P8? 11. In �Grail,� the spiritual quest for the sacred relic is taken into space by a fearless monk. The actor who plays him appears in what successful action film with Bruce Boxleitner? 12. Babylon 5 is the center of an international controversy when an ancient war criminal offers to share the secret of immortality with the �highest bidder.� She is called Deathwalker. What is her race of origin? 13. Sheridan used telepaths to attack the destroyer fleet in �Endgame.� Was Bester�s lover Carolyn Sanderson one of the 3D telepaths who were sent into the conflict? 14. The new Interstellar Alliance is reviewed in �Rising Star,� and Sheridan is elected the first president. The �nonaligned worlds,� is a term that refers to the Centauri, the Minbar, the Narn, and ____________________. 15. In Episode #414 �Moments of Transition� the new Grey Council is established. This time each caste is not equally represented as was once the case. Delenn appoints two members from the Religious and Warrior castes. How many does she choose from the Worker caste? 17. Prior to �Racing Mars,� Mars resistance learns a hit squad will soon be in town looking for the leader of the resistance. Following the bombing of the Red Planet Hotel, Psi Corps �Bloodhound Units�: assigned to EarthForce military units are authorized to perform deep scans on suspected resistance members, despite the risk of seizures, heart attacks and strokes. Are there any reported deaths? 18. Captain Sheridan tells Dr. Franklin of his intention to include telepaths in his plans for the future. True or False: Dr. Franklin believes he can design a headpiece that will echo Lyta Alexander�s telepathic impulses and enable her to control the telepaths long distance. 19. True or False: A prescription for Tenastazin leads William Edgars� staff to the safe house in Chicago where they capture Captain Sheridan�s parents. 20. Psi Cop Alfred Bester and a �Bloodhound Unit� are dispatched to B5 by EarthGov in �Strange Relations.� They are to capture Byron and the colony of telepaths living on B5. True or False: Byron was once a promising prot�g� in Bester�s program? Bonus Question #2 The Fresh Air restaurant delivers pizza. True or false? You�re too young to experience that much pain. JMS wrote: 20 years ago today, the very first frame of film was shot for the Babylon 5 pilot, "The Gathering". Great thanks go to everyone who contributed to this show, from JMS to actors to all the creative people who brought their skills in bringing the show to life. B5 has brought many, many people hours of entertainment, helped form communities and even encouraged some good things to happen in the real world. Deathwalker - Sarah Douglas as Deathwalker/Jha'Dur, Robin Curtis as Ambassador Kali. but its always there. The key is not to eavesdrop unless invited. The movie covers the Earth-Minbari War in more detail, including Delenn's involvement and the death of Dukhat. The Battle of the Line The famous battle of the line scene from Babylon 5, In the Beginning. Note: The guide page assumes prior knowledge of the first four seasons of the show, since the movie originally aired after season four was complete. There are spoilers in the plot summary/analysis for the series. Alpha Centaurus, Toliman's splendor naturally made it an object of worship on the Nile, and its first visible emergence from the sun's rays, in the morning at the Autumnal Equinox, has been connected with the orientation of at least nine temples in northern Egypt dating from 3800 to 2575 B.C., and of several in southern Egypt from 3700 B.C. onward. As such object of worship it seems to have been known as Serk-t.
Alpha Centaurus lies in the Milky Way, 60� south of the celestial equator, culminating with Arcturus, but is invisible from north of the 29th parallel. It is of the greatest interest to astronomers, being the closest star to Earth, at 4.3 light years. Alpha Centaurus, Toliman, is a binary, white and yellowish star above the right front hoof of the Centaur. Toliman or Bungula is the third largest star in the sky. An Earth Alliance colony. Location of tachyon relay station, used for communications. Seceded from the Alliance in 2260, demanding that President Clark be impeached. Clark then blockaded the colony, preventing even humanitarian aid from reaching the inhabitants. Late in 2261 it was liberated by Sheridan's forces. Star Chart: The native with this star well placed in the nativity map may expect the influence to give beneficence, friends, refinement and a position of honor. Traditional: Involves the last five degrees of the zodiacal sign Scorpio. Relationships with women require special attention when "things do not advance smoothly", there may be differences in aspirations, religious ideas, moral sentiments, ethics and fundamental spiritual leanings in the individuals; or an existing relationship is stricken by exceptional circumstances. Re past lives: both people may have reached a different achievement [initiation] level and may be working on different ethical procedures in business or other affairs. Disturbances, riots, periods of storm and stress and revolt against curtailment of freedom. The movie deals with an enormous artifact that is discovered in Hyperspace and towed to the Babylon 5 station for investigation, at which point the xenoarchaeology organization Interplanetary Expeditions sends a representative, Dr. Elizabeth Trent [Shari Belafonte], to take control of the examination. After being placed near the station, the artifact begins to influence the dreams of many inhabitants of Babylon 5, and eventually controls many of them during their waking hours as well. According to J. Michael Straczynski, the film is based on the writings of H. P. Lovecraft (most noticeably, "The Call of Cthulhu"), although Lovecraft's creatures (the Old Ones) are not actually referred to by name in the film. G'Kar: No one here is exactly what he appears. Psi-Cops - "We're everywhere, for your convenience."